SAY “Yes” to mischief as Sooty and his pals are scuttling to town this half-term! If you’re looking for the perfect way to keep the kids entertained during the Easter Holidays then look no further than The Sooty Show, which comes to St David’s Hall at 11am and 2.30pm on Thursday 2 April. Everyone’s beloved bear is now a national treasure having entertained millions of children for nearly seven decades! And in his brand new show you can expect even more jokes and japes to guarantee giggles for adults and children alike. Joining Sooty is the lovable duo of Soo and Sweep, plus Butch the Bulldog and Ramsbottom the Snake. Also sharing the stage will be Sooty’s friend and familiar face on CITV Richard Cadell, who will have his hands full keeping them all out of trouble! Sooty was originally devised by Harry Corbett, who bought the puppet as a present for his son Matthew from a stall when he was on holiday in Blackpool in 1948. Since then the show has blossomed under various guises to earning its place in the Guinness Book of Records as the longest running children’s programme in the UK! The cast of cute characters have been proud family tradition for father and son, who presented the show for nearly 50 years before co-star Richard Cadell became Sooty’s sidekick following Matthew Corbett’s retirement in 1998. All the gang have a great show in store this Easter – it’s Sooty’s birthday party and things aren’t going to plan…Sooty and Sweep get messy baking the birthday cake, and will Soo ever decide which dress to wear? Find out for yourself at St David’s Hall! 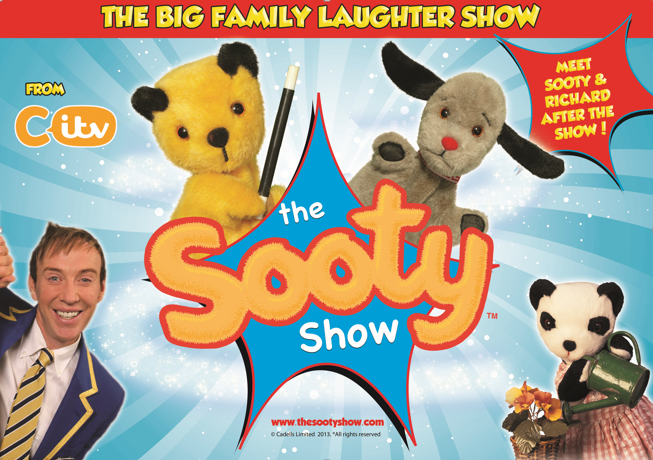 There’s even a chance to meet Sooty and Richard after the show! Make sure to bring your magic wand – Izzy Wizzy let’s get busy! The Sooty Show is suitable for all children aged 2-7. Tickets are still available priced £14 for adults and £12 for children. A Family Ticket of 2 adults and 2 children is £42 (all prices are subject to an additional £2.95 ticket service charge per transaction).